In a small saucepan, bring 4 cups of water to a boil. Add the eggs; reduce the heat and simmer for 6 minutes, depending on the size of the eggs. Run the eggs under cold water, peel and halve; the eggs should have nice golden, creamy yolks. On a large plate, spoon dollops of Romesco Sauce, then nestle in the egg halves. Finish with a dab of Romesco, a drizzle of olive oil, a sprinkle of sea salt and a parsley leaf or two. In Recipes-list.com we have selected the most viewed recipes from category - uncategorized . Enjoy the best recipes specially selected for you! 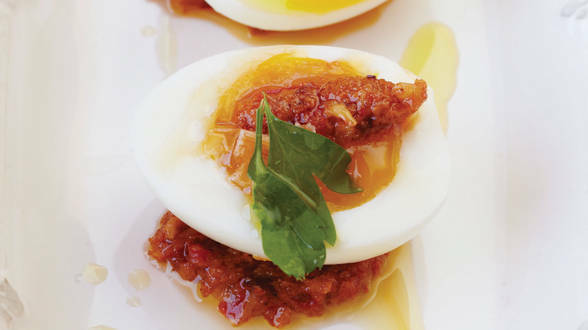 6 Minute Eggs with Romesco is the right choice that will satisfy all your claims.